I’d flown from Memphis to Chicago on Tuesday evening and spent the night at my friend’s house. Then we spent a leisurely morning doing a few last-minute things before driving to the airport garage where she’d park while we were gone. Mid-day, mid-week it’s about a 45 minute drive from her house to the airport. We had left in plenty of time but were over halfway to the airport when I realized I’d left both my charging cords at her house. Well, we’d stop and I could get another one at Walmart. Then I realized I’d left my tablet there too. Oh boy was the trip off to a great start or what?! I still had my phone so we did stop and get a charging cord – I’d needed one to keep at work anyway – and we were able to get a family member to stop by her house and turn off the tablet so it all ended well but it was quite a bummer to start things off like that. We spent most of our time waiting in the American Airlines lounge. I won’t review it because it was fairly busy and I didn’t feel comfortable taking photos. 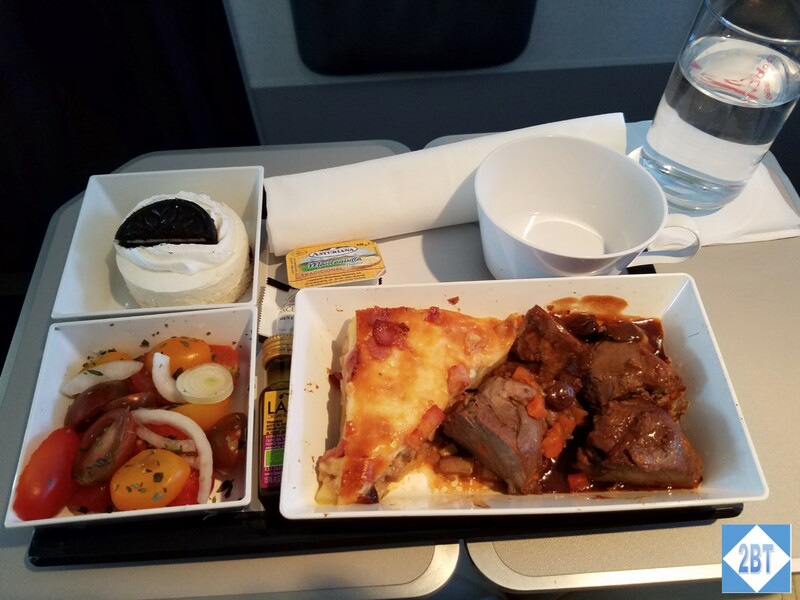 The food actually looked pretty good, but we’d eaten before we left for the airport and knew we’d have dinner aboard our flight. At least we got wifi and nicer bathrooms. 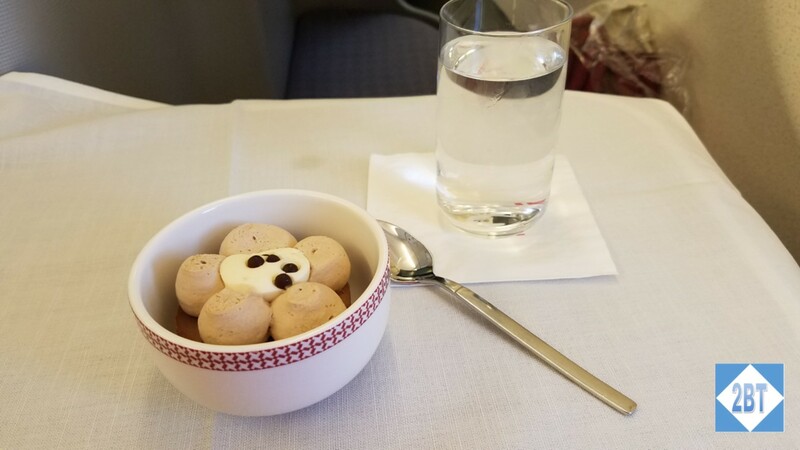 We boarded pretty much on time and I walked through the galley to the far aisle and all the way down to the first row, where I had a center seat on the aisle. My friend was beside me in 1E. The pairs of center seats alternate with one row having the seats close together and the other having them separated by the storage compartments and more exposed to the aisle. While this second kind might be preferable if seated by a stranger, we had the seats close to each other with the storage areas on the aisle. Neither of us are small people and it did mean a little maneuvering each time we left our seat but it was nice to be able to chat without having to lean forward and speak up. 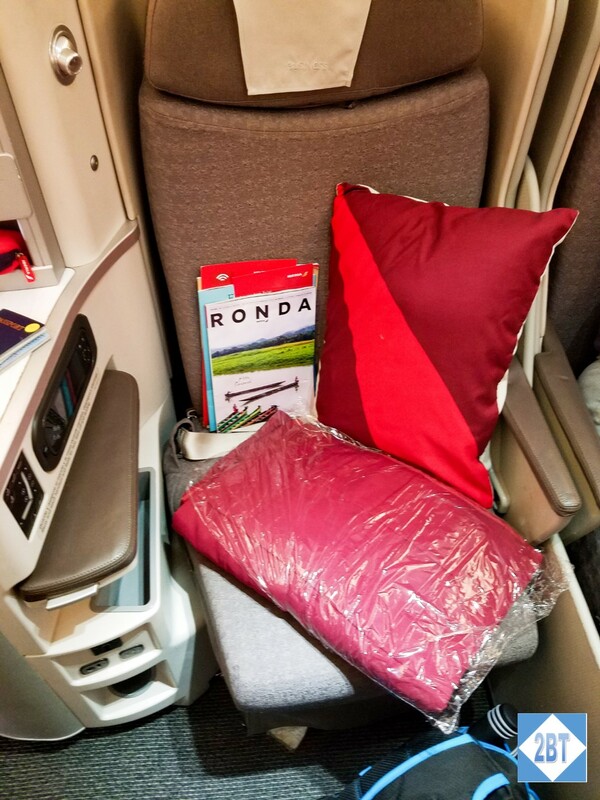 Waiting for us at our seats were a pillow and a blanket, with the in-flight magazine and safety card on the seat. I guess they hope people will look more closely at those items if they have to put them away. On the large aisle armrest was an amenity kit and in the compartment just behind that, the headphones. Some would probably complain they’re not made by Bose and I’m sure if I did a side-by-side comparison I could hear the difference but the headphones did what I wanted and that was to block enough noise so I could watch the IFE. 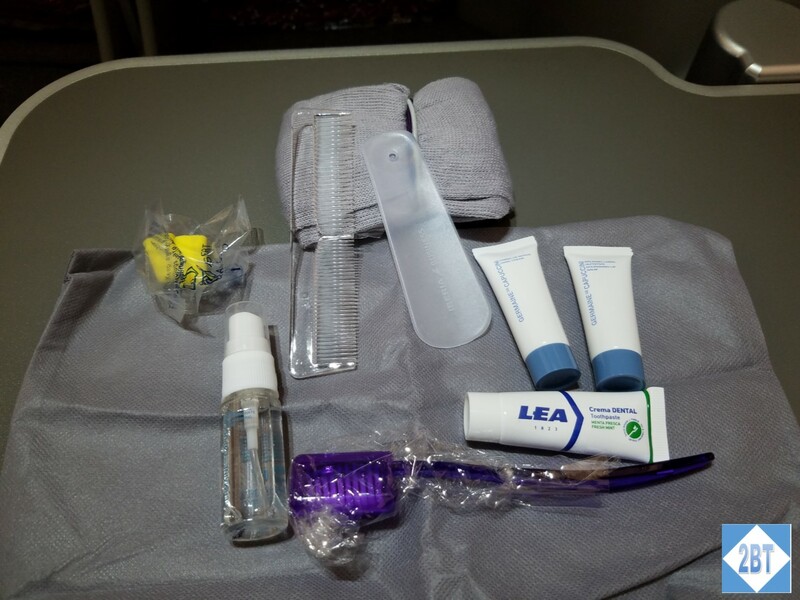 The amenity kit had the usual items. The IFE screen was nice and large and there was a deep cubby for my feet. I did not have any issues with my feet feeling confined when I slept. 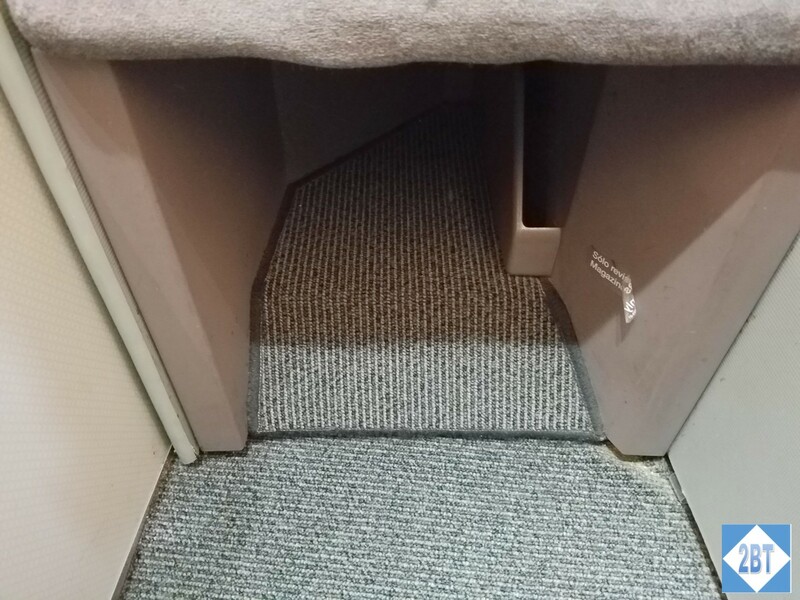 Underneath was an area that could be used for shoe storage. Bags were not allowed in this area during takeoff and landing but I had the overhead bin to myself so it worked out fine. 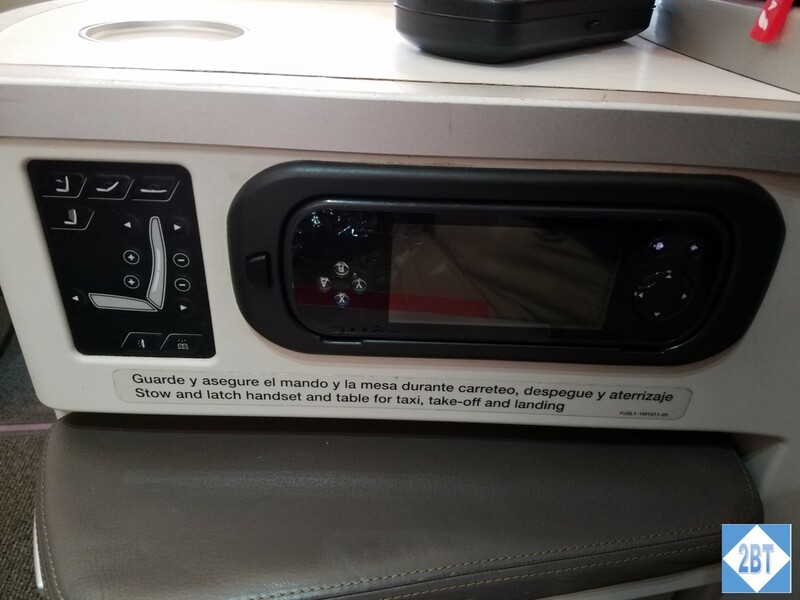 The tray table was stored in a different manner than I’d ever seen before. It folded up vertically against the “doorway” to my little pod. 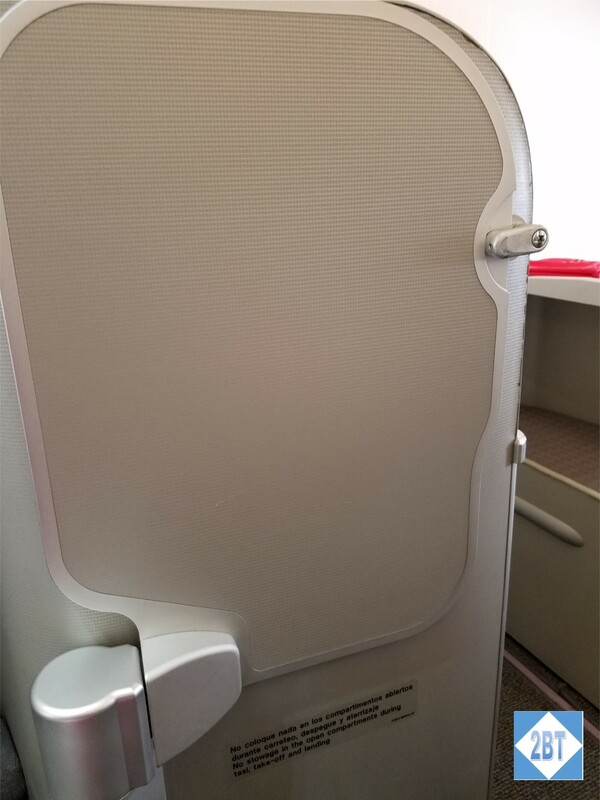 When unfolded, it pivoted over my lap and then, in truly brilliant design move, could be pushed further away, toward the IFE screen, far enough that I could leave the tray down and still get in and out of my seat. That was fantastic for being able to leave the tray down and not having to rearrange things if I chose to get up. At my seat the seat controls and the IFE controller were on the right (aisle) side, just above the armrest. They were fairly standard and easy to use. 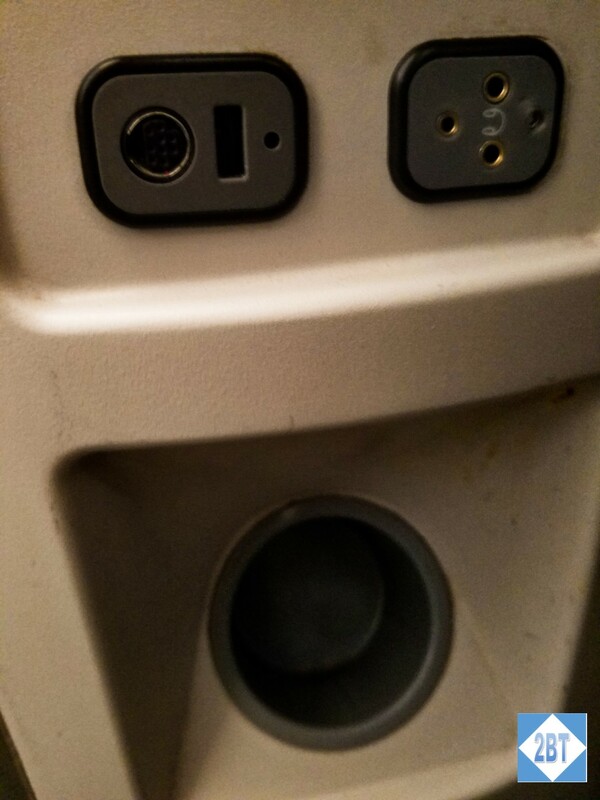 The headphone jack and USB port were underneath the armrest stanchion. Below that was a holder for a water bottle that could be easily accessed when lying down. Kudos to whoever thought of that. 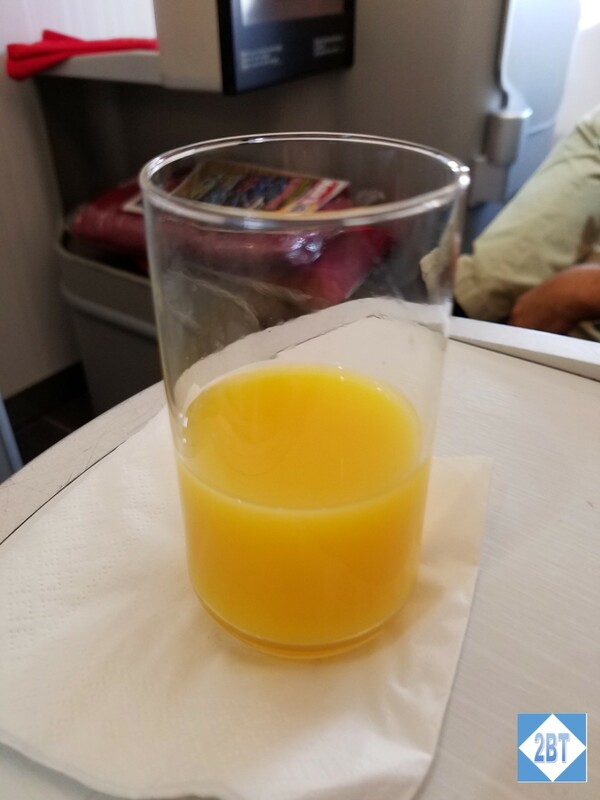 As a pre-departure beverage I chose orange juice. We officially pushed back about 15 minutes late though it was closer to 30 by my watch. We were further delayed taking off but it didn’t matter in the long run as we arrived early. 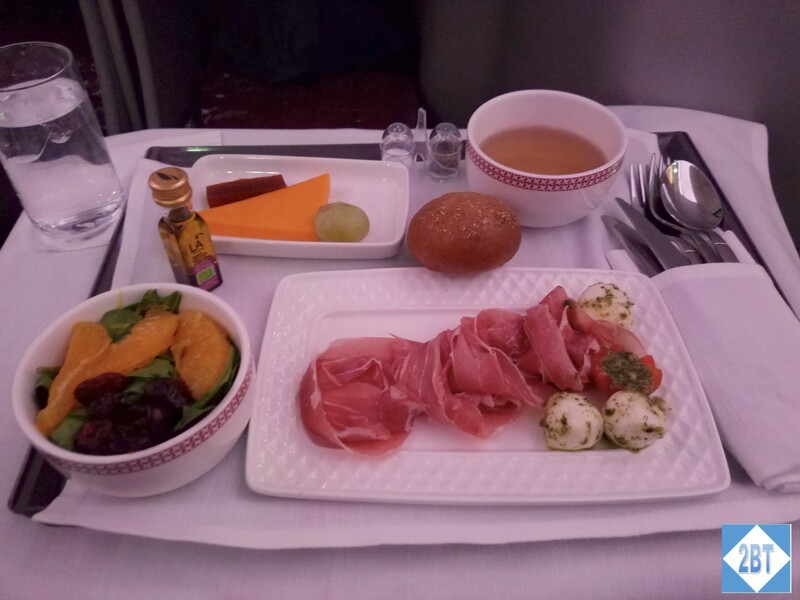 Before take-off we were given the menu which featured Iberia’s signature colors. 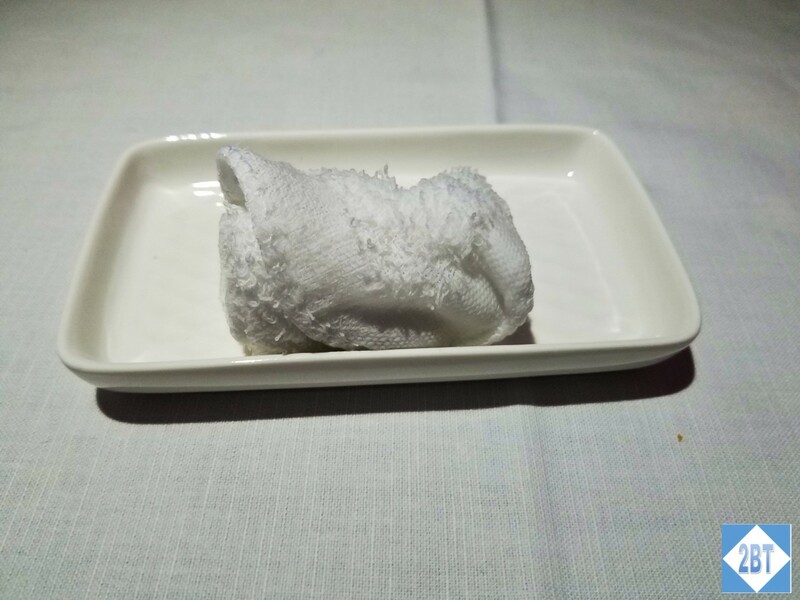 About 1h 20m after our scheduled departure time meal service began with a hot towel. 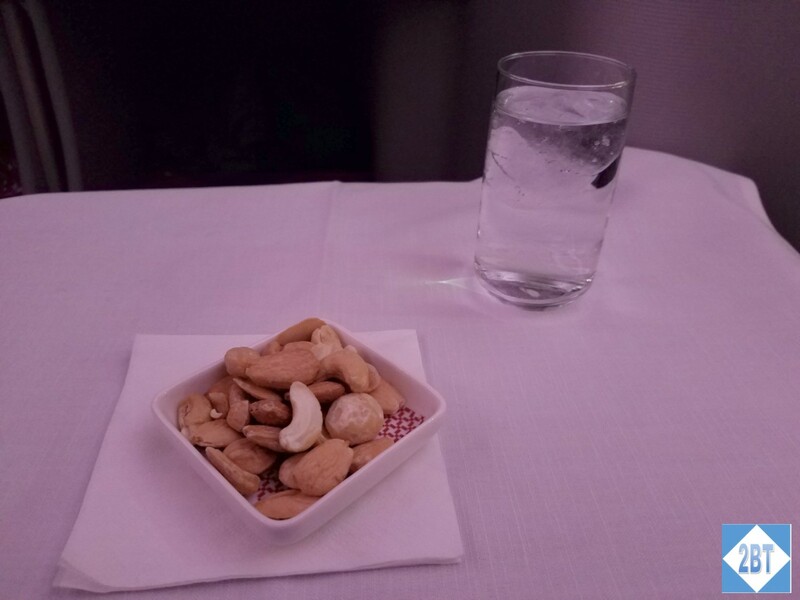 Next up was a glass of water and nuts, both of which were served cold. I learned I prefer hot nuts on my flights! 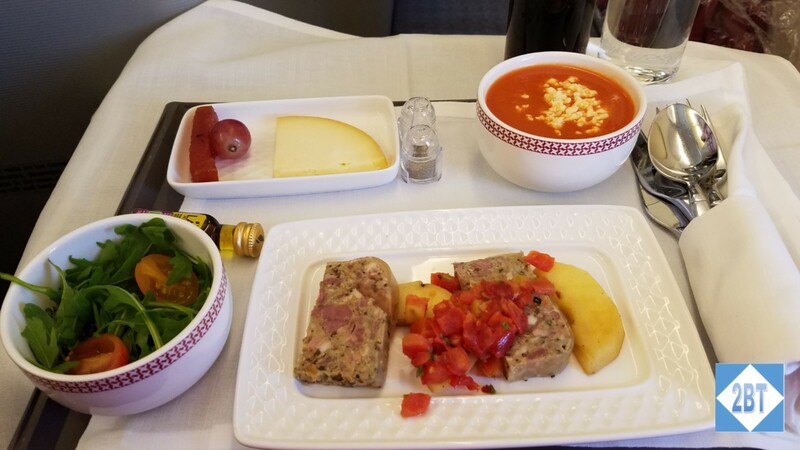 The starter consisted of a cheese plate with a single grape, chicken consomme, a small salad with orange and dried cranberry, prosciutto with mozzarella and a cherry tomato with pesto sauce and a choice of warm bread. For the entrees my friend had the veal with broccolini, potatoes and carrots. It was fine but not memorable. 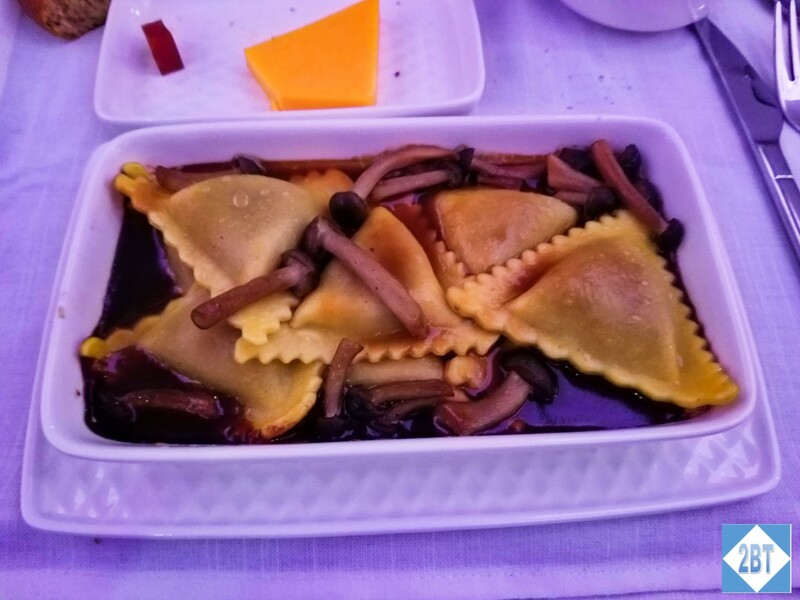 I had the mushroom ravioli in a wine sauce with more mushrooms on the side. It wasn’t terrible but was a bit heavier than I’d hoped. I’m not a huge shrimp fan but that may have been the best choice on this flight. For dessert we had the apple cake and the caramel ice cream. Again, no chocolate for dessert. Why is that? These were fine, even good, but I’m really a chocolate-lover. After stretching out for the night, our flight hit some minor turbulence – I’d give it a 4 of 10 – but it was enough to interrupt sleep. My friend even ended up sleeping more upright because she was getting a bit sick to her stomach while lying down. I didn’t have that issue, but the bumps were enough to prevent me from getting a good night’s sleep. Next time I’d also try to sit further back. I don’t know why the flight attendants had to keep opening and closing cabinet doors all night but they sure seemed to do a lot of that. I probably dozed off and on for 3-4 hours but didn’t get any deep sleep, which was disappointing but not really anyone’s fault. 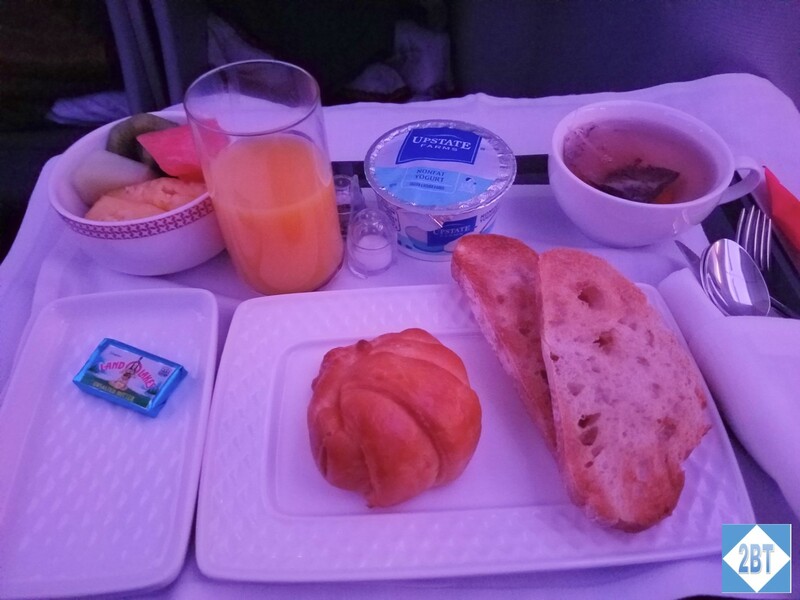 About two hours before arrival the flight attendants began to serve breakfast. Considering it had been less than four hours since dinner, I was fine with the light breakfast that was served on one tray. It consisted of fresh fruit, juice, yogurt, toast and a croissant along with coffee or tea. When we’d booked this trip, there was a reasonable layover before connecting to Amsterdam. 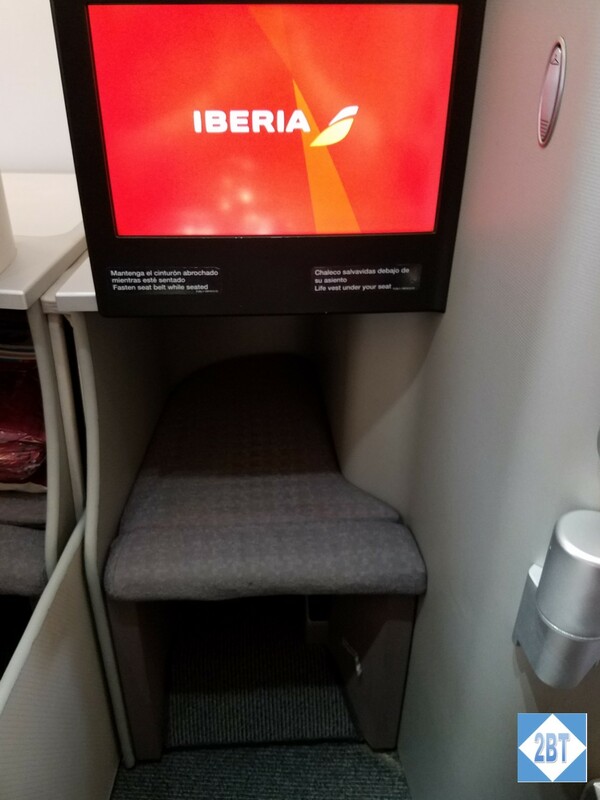 Roughly two weeks after booking, Iberia quit flying MAD-AMS in the mornings so we had an all-day layover. Rather than hanging out at the airport all day, we booked a private tour of the city. It wasn’t especially cheap but it gave us a flavor of the city and was enough for us to know we would like to come back for a proper visit. As it was raining all day we didn’t get out of the car and actually returned to the airport a little bit earlier than planned but we were OK with that. The Iberia lounge was closed and we were given a certificate for a sandwich and a drink at any one of several specified restaurants in the terminal. We used our Priority Pass cards to pass the time at the Plaza Mayor lounge. It was fairly crowded, as you’d expect with the Iberia lounge closed, and not particularly quiet, though it was more quiet than the terminal. Our flight departed from T4 so we eventually made our way there for our connection to Amsterdam. 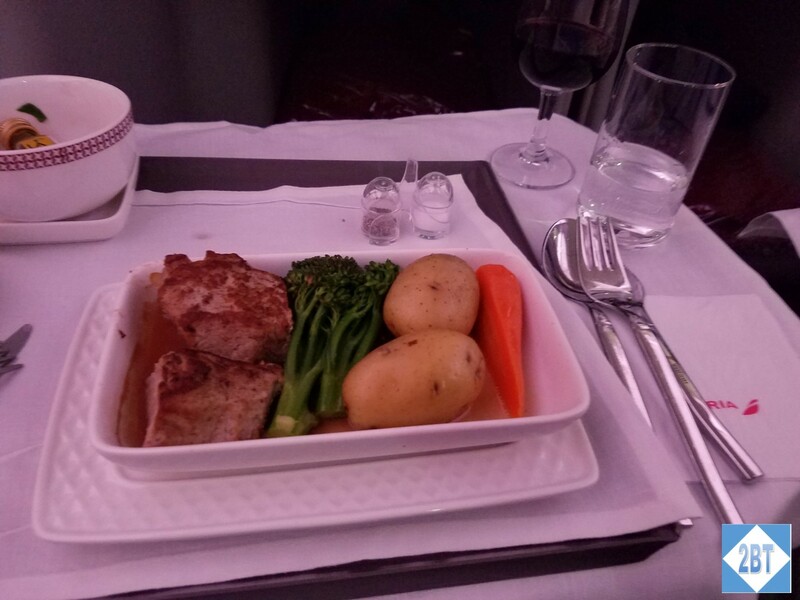 This flight was on an A320, so we had the usual intra-Europe business class seats. Dinner was served and it was fairly edible. Knowing that we would be getting to the hotel after 8 PM, I did a decent job of eating it. I believe it’s some sort of beef, a quiche, tomatoes with onion and some sort of dessert. Our flight landed without incident and after retrieving our bags we were actually a bit early to meet with our driver from Blacklane. But he showed up on time and took us promptly to the Kimpton. Our return flight was very similar to our flight over, but without the turbulence, thank goodness. We pushed back from the gate right on time and taxied for about 20 minutes before taking off. 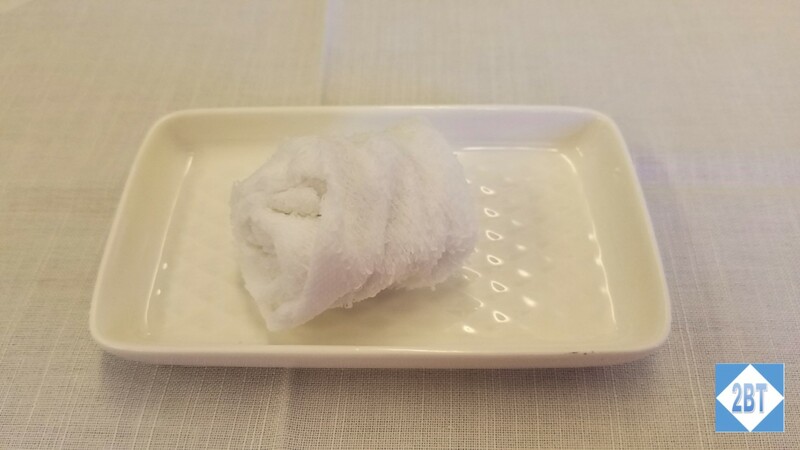 Lunch service began about 50 minutes after takeoff and started again with a hot towel. Next up were the (cold) nuts and beverages. The appetizers were served and consisted of a salad with black quinoa and tomatoes, goose terrine with baked apple slices and tomato brunoise, cheese with quince paste and grapes, gazpacho with egg and bread. 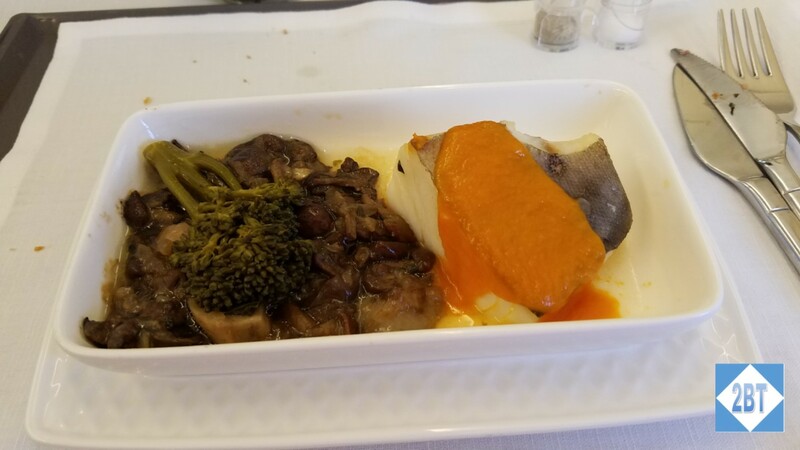 For the main course I had the cod with wild mushroom ragout and steamed broccoli (which had been steamed a bit too long). It was edible but not memorable. For dessert I had the trip of chocolate cake though this didn’t really look like what I was expecting. But at least it was chocolate. 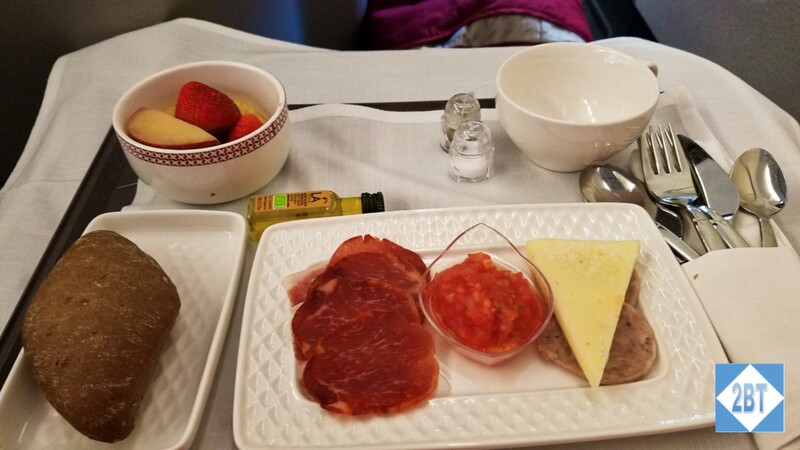 About an hour before landing we had a snack of ham, sausage and cheese, tomatoes and fresh fruit along with our choice of bread. I’d have preferred more fruit and less meat. But I wasn’t hungry once we landed. On both flights the crew was nice but not overly proactive. They did their jobs and were very pleasant but they weren’t as attentive as, say, Asian flight crews. Then again, I tend not to try to bother them too often and keep to myself. 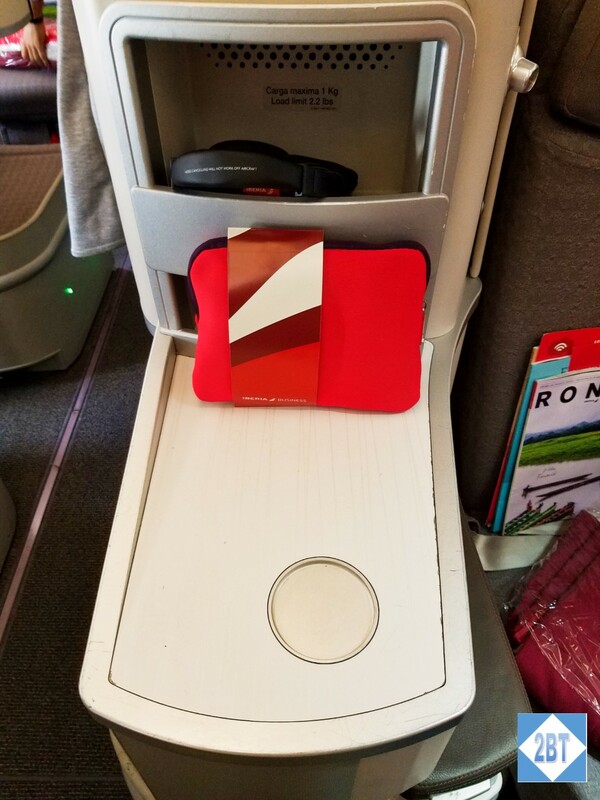 When using American Airlines miles to get to Europe there are three main choices: AA, who make very few premium cabin seats available, British Airways, which comes with terrible fuel surcharges and Iberia. 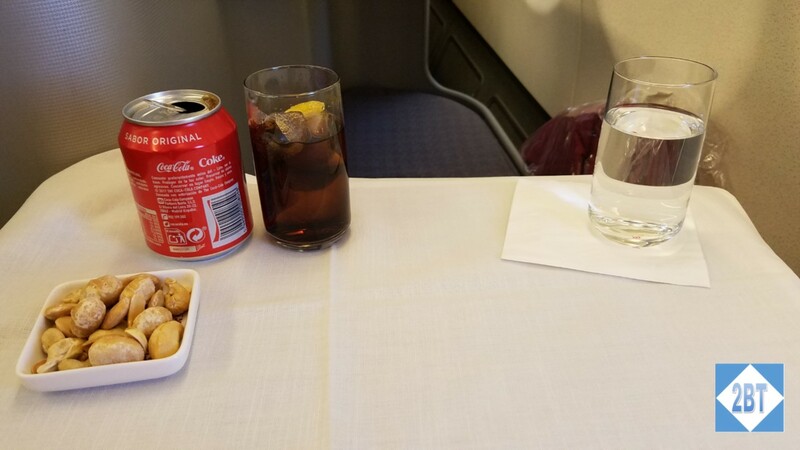 I would have no qualms about flying Iberia again as transiting Madrid was better than transiting Heathrow and at least we were able to find award seats.